Well I'm running a day behind, but better late than never.... It is time for the Crafting with Kids challenge. 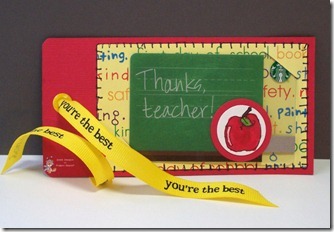 This month your task is to have kids create something for a Teacher or a Grad. Feel free to use any medium you wish. Here is a fabulous piece made by Miss Annabella over at Bugaboo. I love this tag! Are your kids ready to get busy? 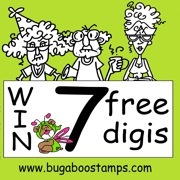 Link up with me before the challenge closes on May 20th and be entered to win a set of 6 digi stamps of your choice from Bugaboo Digi Stamps. This is a such a fabulous prize. Bugaboo always has such a great selection to choose from. YEAH! I finally had a chance to play along! My son LOVED it! Thanks for making this about the kids!!! Congrats! You're my winner send me an email and I'll send you the winning code. Thanks for playing! We're back!!!! We love your challenges...keep it up....P.S. Little Hands Challenge Blog is Anything Goes. Hope your girls (and anyone else) enter. Such a cute bookmark. Thanks for playing again. The girls and I will definitely be checking into the Little Hands Challenge this summer. We'll be on summer vacation after next week and need something to do. How exciting! I think this is the first competition that had more than one entry! The projects were both adorable. YEAH! Nathan is so excited! What a fun challenge! We'll definitely be back!